During the International Conference 2017 in Kigali, Rwanda, “Peace Eduation” and “Quality Education” were defined as central themes of GPENreformation. The network’s Ambassadors are crucial for dealing with and disseminating these issues – on a global as well as a regional level. Therefore, from November 22 to 25, 2018, they met for the first GPENreformation Ambassadors’ Assembly in Arusha, Tanzania, to discuss their role, tasks and communication channels. 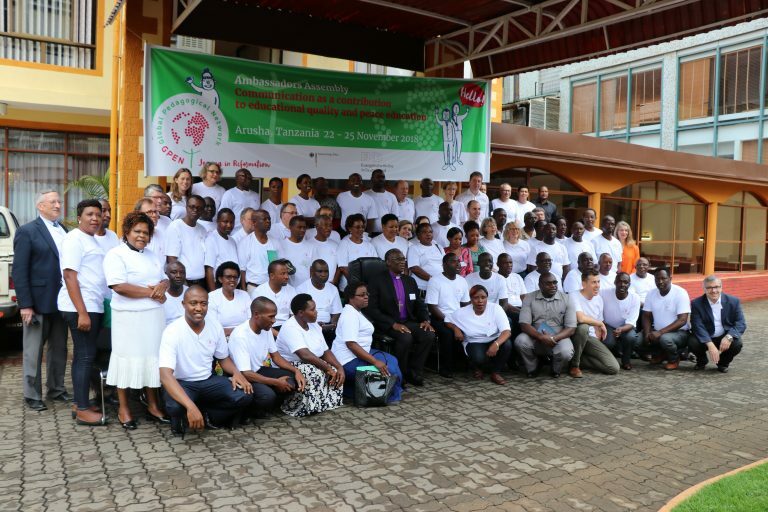 In addition to the Ambassadors, numerous other representatives of important organizations of the global Protestant education sector as well as school administrations, teachers and educational actors from Tanzania took part in the conference. Under the heading “Communication as a Contribution to Quality Education and Peace Education”, the 85 participants exchanged their own experiences and perceptions and discussed innovative concepts and approaches. The Ambassadors’ Assembly was jointly hosted by GPENreformation and the Evangelical Lutheran Church in Tanzania (ELCT).